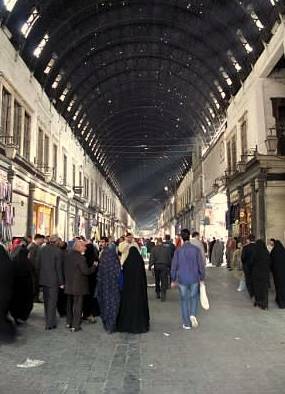 Below pic: It is all locals and business as usual inside the Old City, where the sun’s rays stream through the overhead skylights. No tourists here, save for one German and a couple of camera-toting gringos. 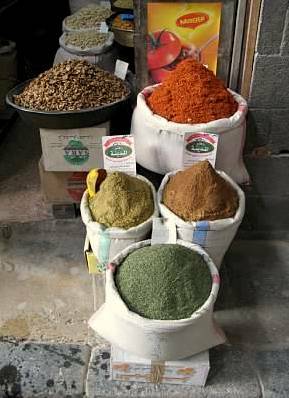 Above pic: Spices for sale by the cup-full. They are as savory as they are colorful. If you’ve been to the Spice Market in Istanbul, this section of the Old Souq will seem quite similar. 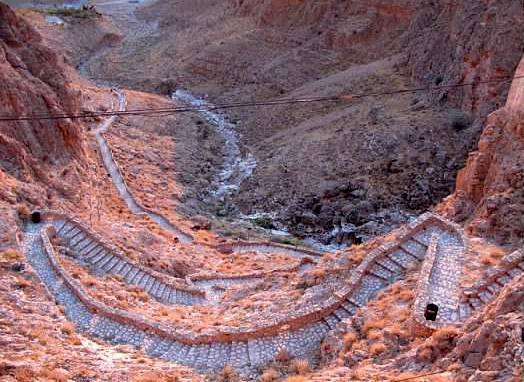 Below pic: This is Straight Street, which dates back to Biblical times and is only just now (2007) being paved. Except for the motorized tractor, blast doors, and air-con unit, not much else has likely changed here in all that time. 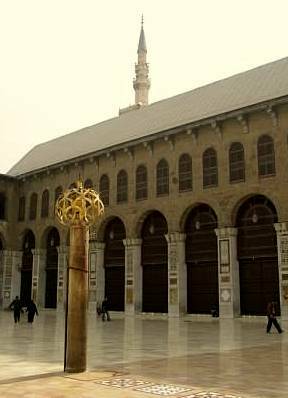 Above and below pics: The courtyard and minarets of Umayyad Mosque, Syria’s largest mosque and one of the holiest sites in Islam. 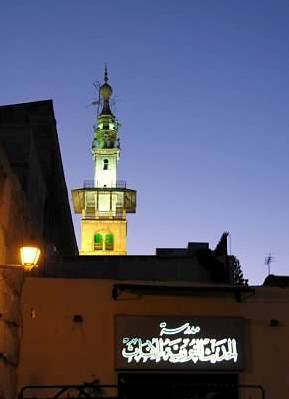 It is believed that at the End of Days, Jesus will descend from Heaven over the minaret in the above pic. 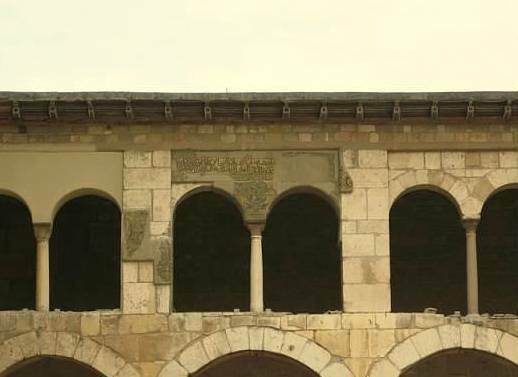 Tragically, the “sister” mosque of the same name in Aleppo (northern Syria) sustained heavy damage earlier this year, and its main minaret has been toppled. 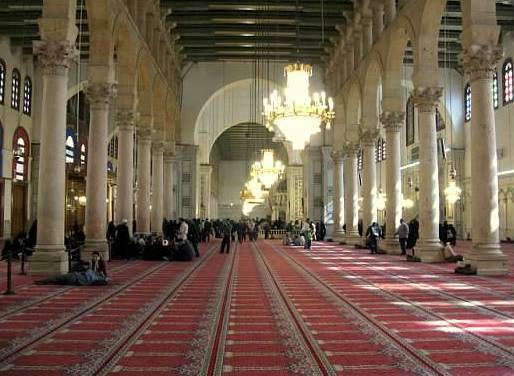 Above and below pics: Umayyad Mosque again. So peaceful and so beautiful. Above pic: Refreshingly, the mosque was open to visitors of all creeds (it has been my experience that many mosques aren’t), although you must dress modestly. 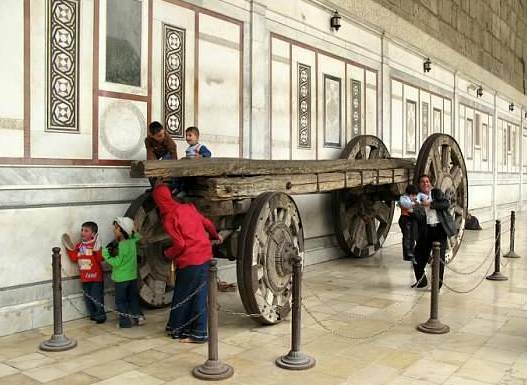 Below pic: Children playing on a centuries-old wagon cart, or battering ram, or something. As with other countries in the Middle East, locals such as these were warm, friendly, and quick to smile. 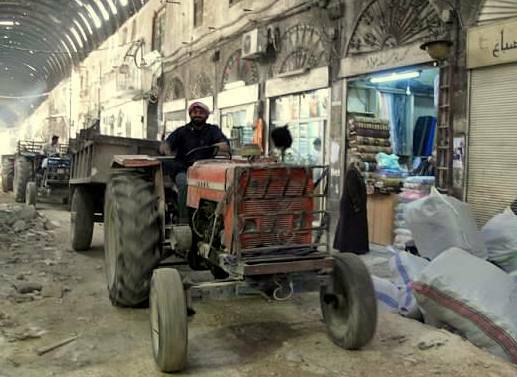 Above pic: Public transportation in Syria. 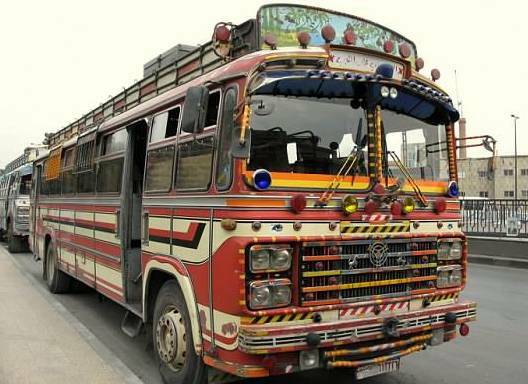 These buses remind me of the ones in Central America, similarly adorned with baubles, horns, and bright colors. 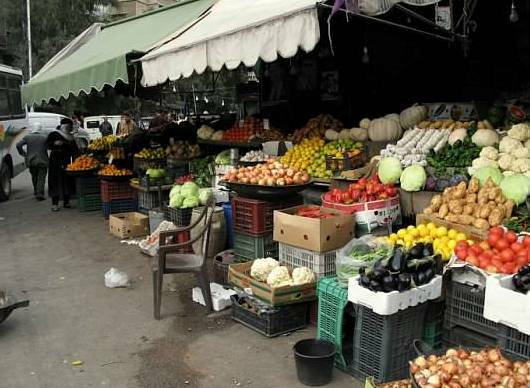 Below pic: The former Jewish Quarter of Damascus, now a produce market. 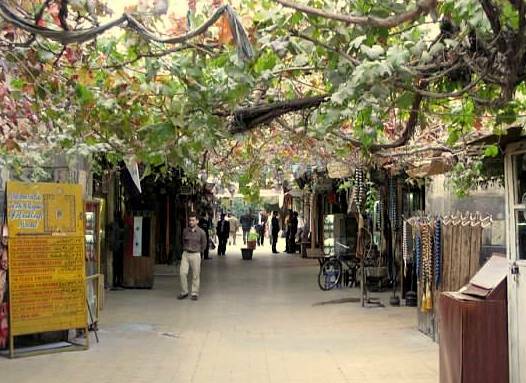 Below pic: Upscale craft and clothing market just outside the Old City. 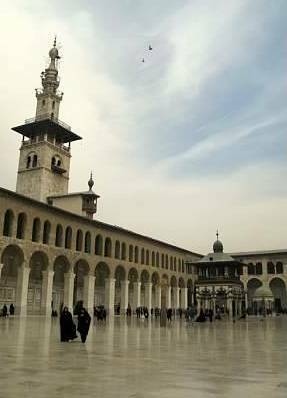 Above pic: Our guide, Damascus-born Masjid. 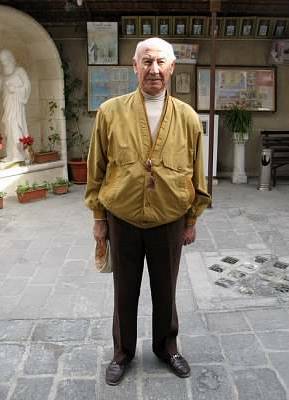 Is it just me, or does he look like the actor Armin Mueller-Stahl? 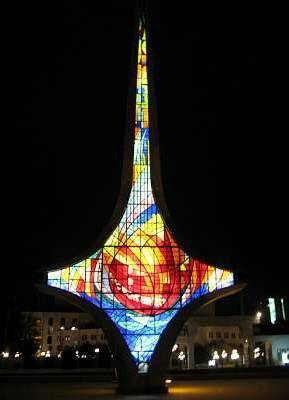 Below pic: This sword, outside the performing arts complex, is one of the symbols of the city. 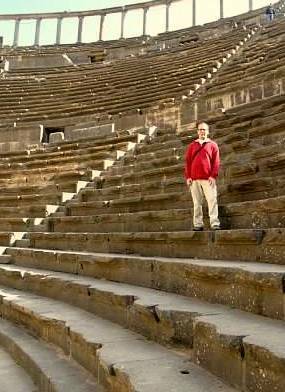 Above pic: 45 minutes south of Damascus and a stone’s throw from the Jordanian border is Bosra, a Greco-Roman amphitheatre. Looks a bit like Petra, yes? 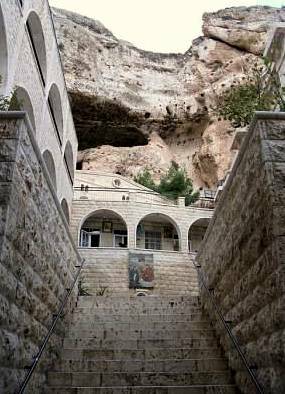 Above pic: Entrance to Mar Takla, a lovely Orthodox monastery in the Christian mountain town of Maaloula. Sadly, this town was occupied by violent fundamentalist rebels in 2011 and 2012, and the fate of this monastery remains unclear. 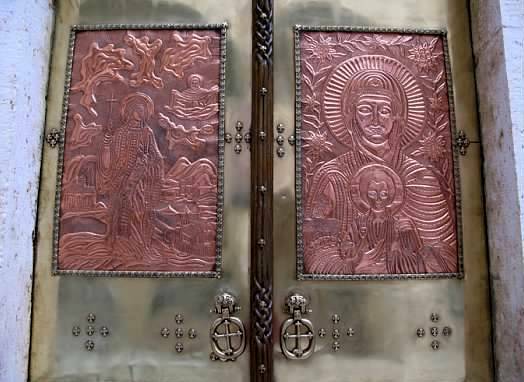 Below pic: Ornate doors to the monastery’s main chapel. 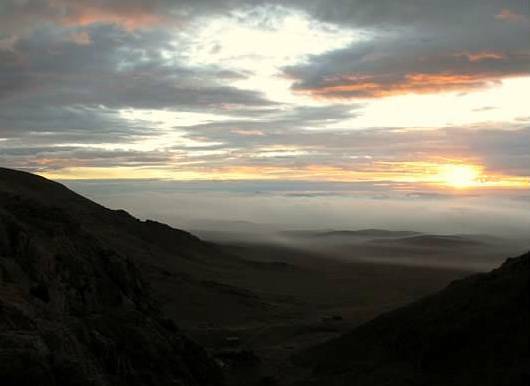 Above pic: Sunrise over Deir Mar Musa, an in-the-middle-of-nowhere mountaintop monastery. Cold! 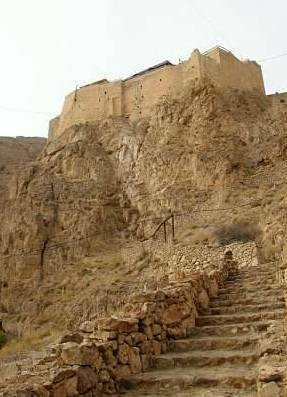 Below pic: Steps leading up to the monastery. Note the orange tint from the morning sun’s rays. 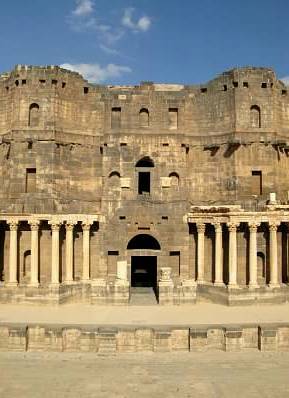 Above pic: The main building of Deir Mar Musa, as seen from below. 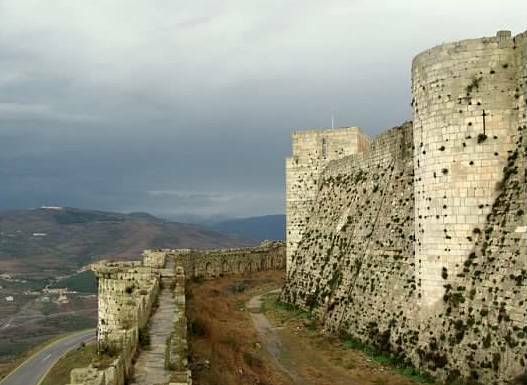 Below pic: Crac des Chevaliers, a magnificent crusader castle that, I’ve read, provided shelter for King Richard the Lionheart during the Third Crusade. This was the only place where we encountered any sizable tourist numbers, and most of them were from a large Japanese group. The rain cleared midway through our visit and someone in one of the ramparts pulled out a grill and starting cooking some of the most succulent chicken I’ve ever tasted. You can find video on YouTube of smoke coming from the ramparts during the siege of the castle and town below, sometime during the past 2.5 years. So sad. 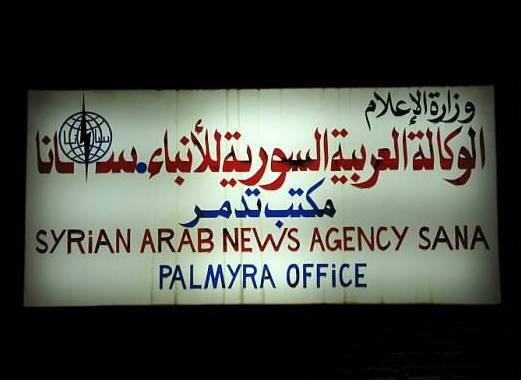 Above and below pics: Cool signs in the desert oasis of Palmyra. 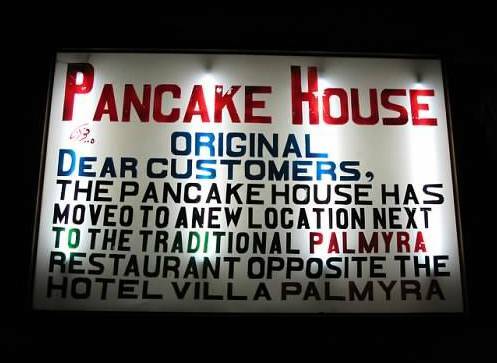 Sadly, the Pancake House was shuttered when we visited, presumably a casualty of declining tourist numbers…although someone still lit up the sign each night. Below pic: …and by day. Note the Alcazar (desert fortress) atop the mountain in the background. For better or for worse, we had these ruins all to ourselves. Above pic: The aforementioned Alcazar, which was closed unfortunately, although we (this is a trend) had the impressive vista point to ourselves. 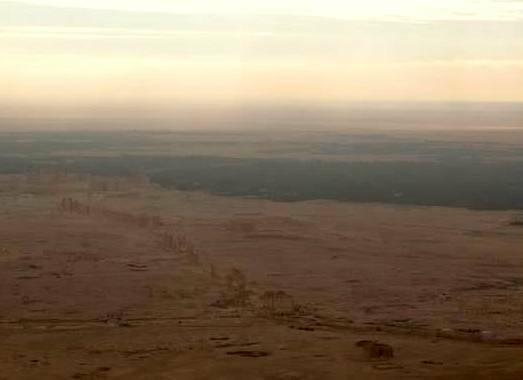 Below pic: Palmyra, as seen from the Alcazar fortress. 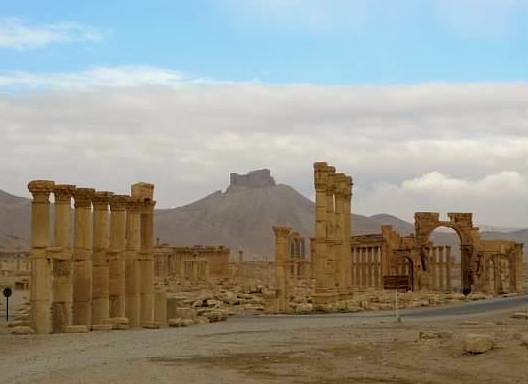 Palmyra was an impressive site, and it sprawled well beyond the focal width of my camera. 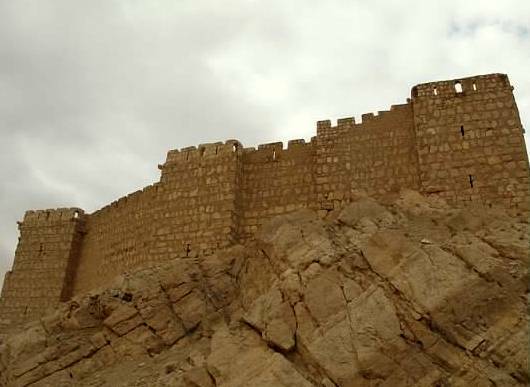 Not pictured are Nabatean (I think) tombs which spread across a whole ‘nother kilometer or two. 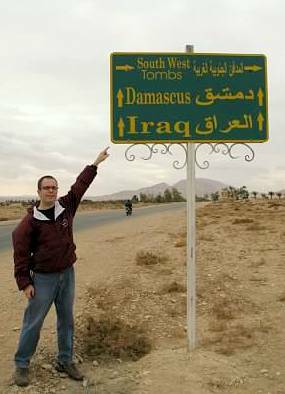 Above pic: Your favorite gringo commentator, roughly 40 minutes from the Iraq border. Yikes! 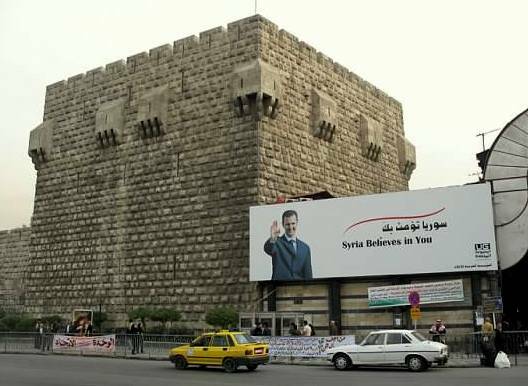 Below pic: This is Assad’s palace, on the outskirts of Damascus. I probably wasn’t supposed to take this picture…Oops! 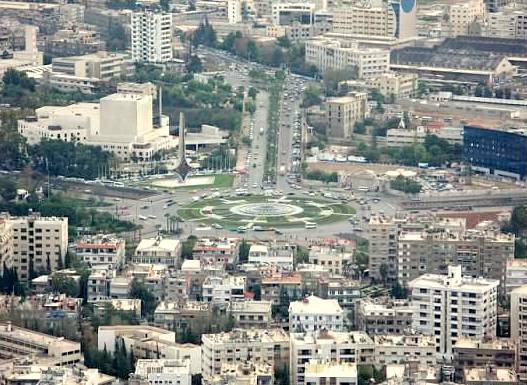 Above pic: Damascus again. Traffic circle, Sword of Damascus, and performing arts complex. This square is similar to Tahrir Square in Cairo, and was the site of much protesting in the early days of Syria’s Arab Spring. 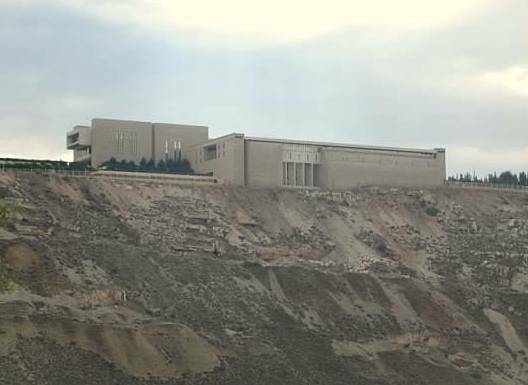 Below pic: The National Museum of Damascus, predictably filled with various antiquities from the state, most of them poorly labeled. 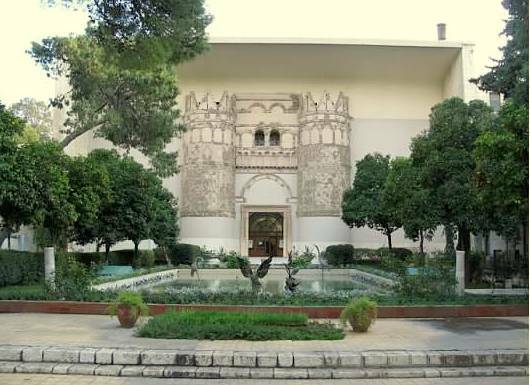 I hope this museum and its collection fare better than their Baghdad counterparts. 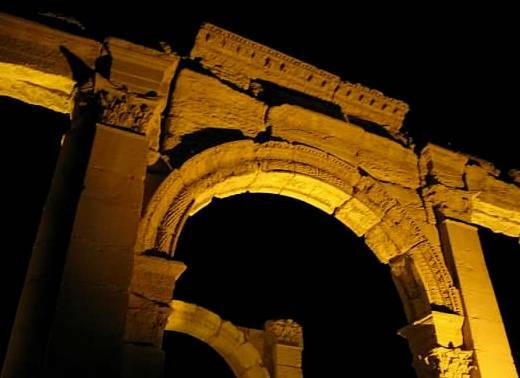 Below pic: Our last night in Damascus gave us time for one last stroll through the stunning Old City. Nice shots. I still know very little about this place. Good to see you scratched it off the bucketlist. 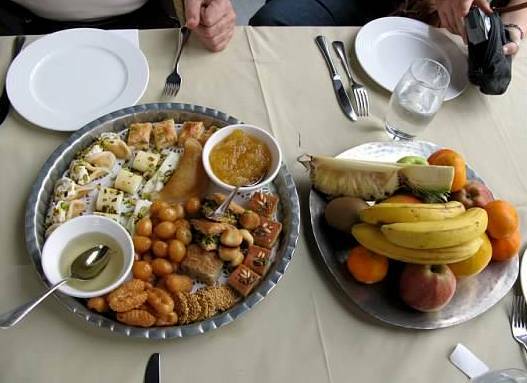 What inspired you to decide on Syria? Next Next post: ¡Viva México!